"Wanted to tell you how great my experience coming in was! Just want to thank you for being so nice and making me feel comfortable in your office. I will definitely recommend you guys to anyone I can. Thanks again for making me feel so welcome!" "Like so many other women (and some men), I have tried everything under the sun to stop that horrible ‘aging process’ short of plastic surgery, which I have a horror of….plus the cost! 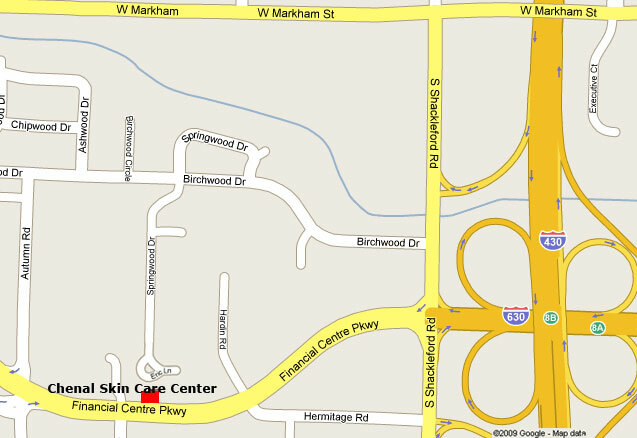 I have been going to Chenal Skin Care since 2004. Vicky started me with microdermabrasion. Then I got hooked on the micropeel, which I still get and look forward to. I also religiously use the Biomedic skin care regimen. I am 61, and I honestly have people comment on my skin! Now, if that is having ‘good genes’ or not, I would not dare stop going to Chenal Skin Care…..thanks Vicky!!!!" "For 10 years I have struggled with acne and trying to find the best makeup to cover it. It appears that most college-age girls like me either have perfect skin OR fight the same battle I do. It seemed every time I tried a new makeup line, from the Dillard's makeup counter to the cosmetic aisle in Wal Mart, nothing seemed to work just for me. Either my makeup made me break out more, dried me up like a prune, or it left me feeling more oily than I started out--YUCK! Now that I have my acne under control, I also have the makeup to go along with my flawless face! YoungBlood mineral makeup is the answer! Even when I have a slight break out it provides the coverage I need--coverage I never thought it could! I'm SO impressed with the results and the way my skin feels I felt compelled to write a review and share my secret! Youngblood is the makeup dermatologists and skin care professionals recommend. It has less ingredients which makes for less pore clogging and less damage (what a relief)! Finally! Youngblood listened and made a healthy makeup for my face that feels weightless and makes me look beautiful!" "It doesn't matter if you are 14 or 44, acne can be a self confidence problem. After my first treatment at Chenal Skin Care, I saw an improvement in my skin. Over the years, Vicky has helped me find the right treatment and products for my skin. Her individual plan for me has cleared up my skin and has given me back my confidence." "As I age and go through hormonal changes, Vicky keeps me pretty. She pays attention to the factors that contribute to changes in my skin and acts as a teacher and advisor regarding all things skin-related. Thanks to Vicky's knowledge and skill my skin maintains a healthy glow." "I have been using Vicky at Chenal Skin Care for 5 years. During this time, my adult acne was finally to put rest. With microdermabrasion, IPL treatments, and Vicky's products, my acne scarring has been diminished. Fine lines and wrinkles are dramatically reduced. In my opinion, she is the finest aesthetician in the state." "For years I tried every skin care line, from drug store to the more expensive department store lines, without ever seeing any results. I still had blackheads and large pores. After spending a fortune (which must have been for the pretty jars and bottles) I had the good fortune of finding Vicky at Chenal Skin Care. In a matter of weeks I saw a huge improvement in my skin, by using the products and beginning the treatments she recommended… my pores became smaller, the blackheads are diminished and my skin texture is smooth and glowing! Now, when someone compliments my skin, I thank them and hand them one of Vicky’s business cards!" "My skin has had a lot of sun damage from years of playing tennis outside and some scarring from chicken pox as an adult, and now I believe that I have a better complexion and a fresher look than I have had in many years. I love the personal attention and the clean, calming atmosphere at Chenal Skin Care. I am grateful to be a client of Vicky Crook’s." I have been a client at Chenal Skin Care for almost a year now. I personally noticed a huge difference in the clarity of my skin within a week of my first treatment. After my second treatment, others started commenting on how great my skin was looking. My pores are now smaller and breakouts are less frequent and less severe than they once were. The products I take home from Chenal Skin Care give me a great clean, smooth glow that people are continually asking about. The staff at Chenal Skin Care are always professional and genuinely interested in seeing real progress resulting from their work. "When I was about 65 years old, my daughter told me about Vicky Crook at Chenal Skin Care and recommended I see her. I told her that at my age the damage had been done and nothing could undo it. Well, for Mother's Day that year, my daughter gave me a gift certificate to go see Vicky. I did and quickly became a believer! That was 6 years ago and I now recommend Chenal Skin Care and Vicky to everyone I see, no matter what their age!"